Patrick Watson (born 1979 in Montreal, Quebec, Canada) is a Canadian singer-songwriter, whose blend of cabaret pop and classical music influences with indie rock has been compared to Rufus Wainwright, Jeff Buckley and Andrew Bird. Singing in the local church choirs as a boy, studying jazz and classical piano performance, composition, and arrangement, and singing and playing keyboards in the ska band Gangster Politics in high school. Singing in the local church choirs as a boy, studying jazz and classical piano performance, composition, and arrangement, and singing and playing keyboards in the ska band Gangster Politics in high school. Watson left the band after graduating and began to explore other types of music, including electronica and ambient. In 2002, after returning from a trip to Vietnam, he decided to start a four-piece chamber pop group, bringing in bassist Mishka Stein, drummer Robbie Kuster (both of whom he had met at university), and former Gangster Politics guitarist Simon Angell. The group (which was technically a solo project with a backing band) released Just Another Ordinary Day (2003) independently. In 2001 Watson released his first own solo debut, waterproof9 and in 2006 his second, Close To Paradise. Early in 2007, Watson was nominated for a Juno Canada's music award in the New Artist of the Year category. His band's song "The Great Escape" was featured on a third-season episode of Grey's Anatomy. He co-wrote and performed on several songs on The Cinematic Orchestra's 2007 album Ma Fleur including the opening track "To Build a Home". His "Missing You" remix of Champion's "Guy Doune", from Champion's 2006 album The Remix Album, reached #1 on CBC Radio 3's R3-30 chart in early 2007. 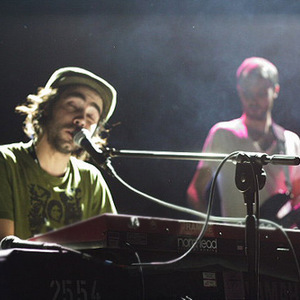 Patrick Watson (the band) also won the prestigeous Polaris Music Prize (Canada) in 2007.